Are you looking for simple wedding cakes for your wedding day? These days wedding cakes really do come in all shapes, styles and sizes. Many modern cakes are elaborate in both size and design. This is fine for some brides, but for others they want something a little more simple and classic. Scrolls and designs can look very nice on wedding cakes. They can add elegance and sophistication to simple wedding cakes. This is a simple and effective way to make your wedding cake beautiful, a real focal point of your reception. Hearts are a traditional symbol of love inside weddings and out. The challenge is to add this symbol to your wedding without looking to cutesy or overdone. This layered wedding cake does a very nice job. The colors look great together and using the mirrored wedding cake plate is a nice touch. Simple wedding cakes always look especially nice with the use of flowers. There are many ways to utilize fresh flowers with your wedding cake. The above photo shows how you should not just limit your creativity with the flowers to the cake itself, the cake table can easy be decorated as well! 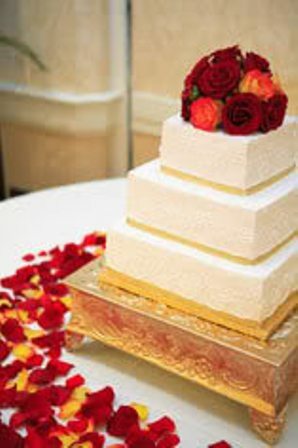 You can use flowers on top of the cake, in between each layer (or on top of each layer, depending on the wedding cake style) or cascading down the cake. You can also use flower petals around the cake in a circle, artistically on the table, or scattered on the cake itself. 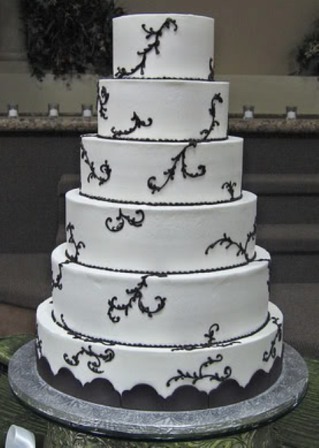 Monograms look really nice on wedding cakes. 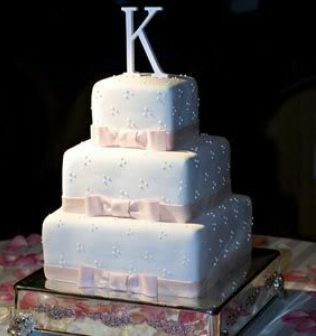 The most popular way to use a monogram or initial is pictured above, as the wedding cake topper itself. 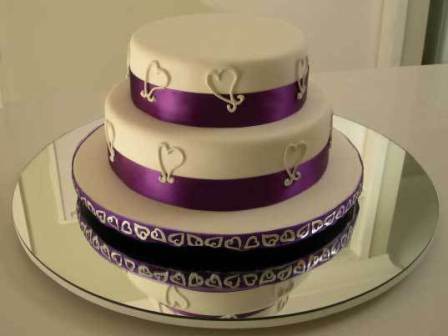 You can also ask your baker about designs they may choose to do on the cake itself. Ask for photos and ideas if this is something that interests you.